Family traditions give me great joy–they keep me connected to my family and my culture. I was curious about my students’ traditions. The students brainstormed about their favorite family tradition using their senses. Many of them had fond memories of celebrating Thanksgiving, Christmas, and Hanukkah. William decided to write about Mardi Gras. Mostly every year I go to Mardi Gras to catch beads. Then we pick out the greatest side (the left side to be exact). It takes about one hour for the floats to come. I hear people screaming like wild hyenas from far away places. As the floats get in range, the screaming echoes louder and louder and louder till…the floats are here, Ahh! We run out in the streets to get beads. Next thing I know, it’s raining beads like a huge snow storm. I watch them fall, yellow, then red and purple. Sometimes green, black, and maroon. Even sometimes, when you’re lucky, you get toy footballs and fake spears and toy footballs shaped beads as the floats go by. I’m waiting for the McDonald float. I yell, “Throw me something” at Ronald McDonald, and he throws me sugar cookies! 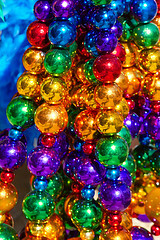 When we get home, we count our beads and wear them. Then I go to bed and eat my cookies, of co urse.